A compound lens is a collection of simple lenses of different shapes and is made of materials of different refractive indices, arranged one after the other with a common axis. Any other antireflection coating wavelength region is available on request. Each kit includes 8 lenses (3 pcs. of lens 1 and 5 pcs. of lens 2), Aluminium Optical Rail 810-0005-02, two Aluminium Rail Carriers 810-0007-06, Self- Centering Lens Mounts 830-0010 and 830-0020, two Rod Holders 820-0050-02 and two Standard Rods 820-0010-02. 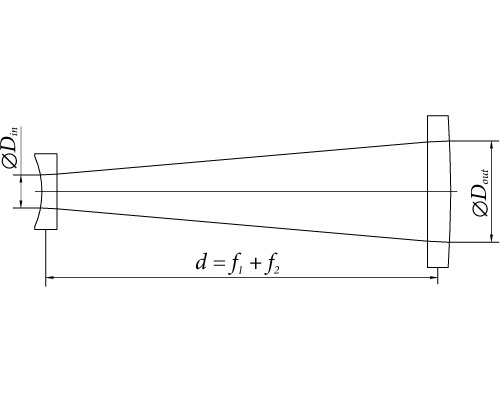 Note that distance between lenses d is the distance between focal planes of the lenses and is given theoretically (the thickness of lenses is not included into calculation). It, also, depends on wavelength. The distance should be adjusted ±10 mm in each particular case. Each kit includes: 8 lenses (3 pcs. of lens 1 and 5 pcs. 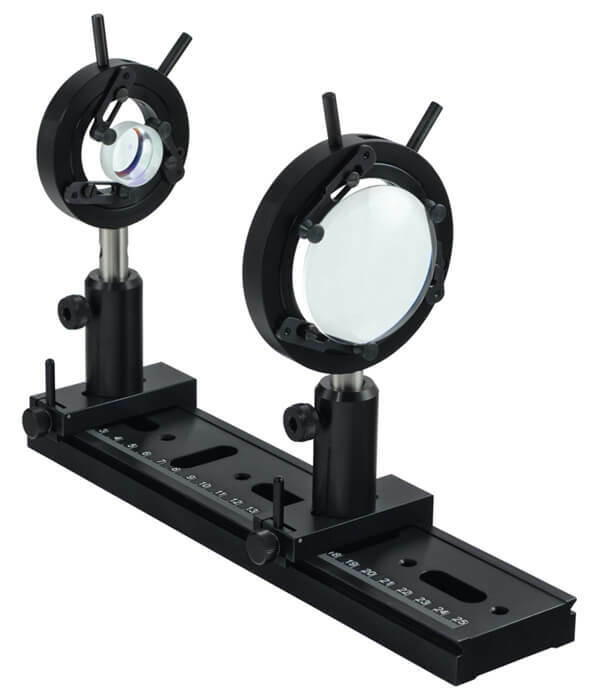 of lens 2), Aluminium Optical Rail 810-0005-02, two Aluminium Rail Carriers 810-0007-06, Self- Centering Lens Mounts 830-0010 and 830-0020, two Rod Holders 820-0050-02 and two Starndard Rods 820-0010-02. Simple lenses are subject to optical aberrations. In many cases these aberrations can be compensated for to a great extent by using a combination of simple lenses with complementary aberrations. A compound lens is a collection of simple lenses of different shapes and is made of materials of different refractive indices, arranged one after the other with a common axis. which is the ratio of the input beam width to the output beam width. Note the sign convention: a telescope with two convex lenses (f1 > 0, f2 > 0) produces a negative magnification, indicating an inverted image. A concave plus a convex lens (f1 < 0 < f2) produces a positive magnification and the image is upright.